The dictionary lists the general vocabulary - nouns, verbs, adverbs, adjectives - which occurs in practically all technical texts. 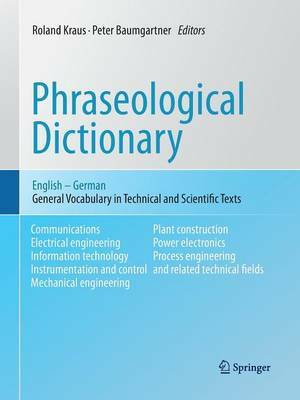 This vocabulary should be mastered by all those who actively or passively work with technical texts since it provides the structures into which the technical terms of various fields of technology are embedded. The keywords are provided with numerous model sentences illustrating their usage and offering the user a variety of suggestions for his / her own formulations.